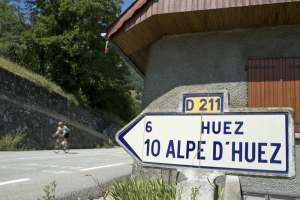 This is Marcel’s report on his first participation in Alpe d’HuZes this year, in which he climbed the French mountain Alpe d’Huez by bike, six times. Together with 9,999 others, he contributed in the battle against cancer. Quitting is not an option for the cyclists who climb the legendary Alp up to six times, solo or in teams. The Alpe d’HuZes foundation, its name in Dutch a pun on those six climbs, aims to convert the frustration caused by cancer into strength: to go beyond limits. It’s not just Marcel feeling impressed by the strength and solidarity he experienced when he joined Alpe d’HuZes: “fantastic event”, “tremendous motivation” , “lots of respect for all the cyclists” and “proud!” are just some of the common reactions on the foundation’s Facebook page. Every time we meet volunteers from the Alpe d’Huzes foundation, we can’t help but notice their unconditional enthousiasm. We take that as an inspiration. That’s why on October 28 we’ve signed an agreement to sponsor Alpe D’HuZes . Because quitting is not an option! One simple remark; GREAT !!! The editorial nailed exactly why I joined Ad6. Thanks for sponsoring, it’s absolutely needed.